I’ve lived in ots of different places, dangled many a key from my chain, hefted moving boxes across the ocean, over state lines, and back. I’m not planning on any of that again. However, when I go to San Francisco I always have that thought: I could live here! Easily. If I did, I’d be at Tartine way too often, working my way through the incredible face-sized croissants, the arm’s length sandwiches. This is one of my favorites from there. Tartine uses the lovely Mt. Tam cheese (try Cowgirl Creamery), but any will work just as well. Additionally, if you can't find membrillo/quince paste, just use apricot jam or peach. Place butter in skillet. 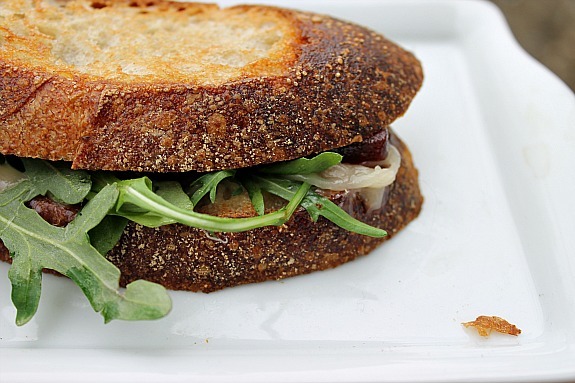 Spread cheese on one side of bread and place quince on the other. Place plain-side down in skillet. 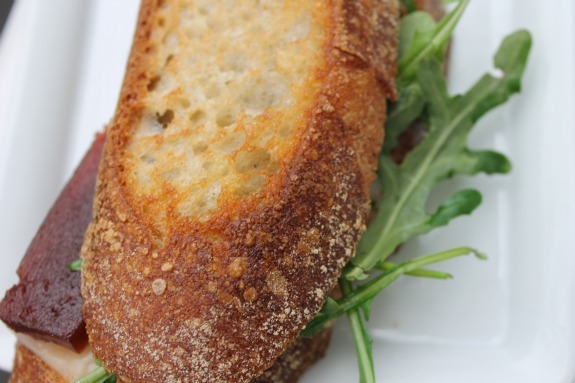 When quince starts to soften and cheese is melting, add arugula and put halves together. Press with weight on top (you can try a foil-wrapped brick if you do't have a sandwich press). Enjoy and dream of other places.